The 12th Annual Lummis Day Festival is happening this weekend, June 2-4, at multiple locations around North East Los Angeles. This weekend of events is a celebration of music, art, food, film, and community that honors the spirit and creativity of Charles Lummis. All events are free and you can find a full list of the activities and their locations on the Lummis Day schedule. Once again the Autry Museum of the American West is participating in Lummis Day by opening the historic Southwest Museum site for the weekend, where they are showcasing a free exhibition, For the Love of the Arroyo, organized by local artist and curator Raoul De la Sota and Roderick Smith. Stop by on Saturday afternoon to meet some of the artists whose work is on display and maybe even take some artwork home! All proceeds from sales of For the Love of the Arroyo will help fund the restoration of the Marmion Way mural. If you can’t be there this weekend, the exhibit will be up through June 18th and open to the public on Saturdays and Sundays from 10 am – 4 pm. This is the perfect excuse to come out and enjoy the beautiful weather, visit the historic Southwest Museum site, and see some beautiful artwork by local artists. Don’t miss it! In October, the Highland Park Heritage Trust (HPHT) welcomed the Southwest Museum Site Steering Committee and National Trust for a special meeting about the future of the Southwest Museum site. Before the end of the year, we wanted to share a few updates from the National Trust and the Autry in direct response to some of the questions and requests that were made at the HPHT meeting. We are continuing conversations with specific potential partners who are interested in reuse and reactivation of both the historic Southwest Museum buildings and grounds and the Casa de Adobe. These conversations are still preliminary, but we hope to have more details to share with the public early in the new year. Thank you to the HPHT for the opportunity to have such an open and productive conversation! Q: Has the Steering Committee met with other stakeholders and other cultural attractions in the immediate area to discuss challenges, opportunities, and collaboration? Yes, both the National Trust and members of the Steering Committee have been meeting with and speaking to a number of potential partners. This includes several arts- and culture-based groups and organizations in the immediate Northeast Los Angeles neighborhoods, as well as arts organizations, museums, educational institutions, and philanthropic organizations in greater Los Angeles. Q: Is the Autry still offering tours of the new Resources Center? Who do we contact about this? Stacy Lieberman at the Autry will arrange another round of tours of the Autry Resources Center for interested individuals in Burbank in 2017. Dates and RSVP information is forthcoming from the Autry. Q: Has cultural programming for youth been discussed? Yes, this has come up on a few occasions and specifically was raised by the Friends of the Southwest Museum (FOSWM) as a priority for their group. Earlier this year National Trust staff met with several teachers and administrators in Highland Park and Northeast Los Angeles to gain a better understanding of their curriculum requirements, and how programming or events might be developed at the Southwest Museum site that would appeal to students and teachers while still satisfying the core curriculum. Contacts and suggestions from all those meetings were shared with the FOSWM. Autry staff have participated in two meetings so far with representatives from the FOSWM to discuss the existing and extensive educational programming already offered through the Autry, and what unique opportunities the Southwest Museum site might present to offer different and expanded programming that would enhance what is provided at the Autry in Griffith Park and through their outreach program in various school districts. Q: What is the status of the mural? The community mural committee—which includes representatives of the Autry, Councilmember Cedillo’s office, and partners such as Avenue 50 Studio—is finalizing an agreement with a muralist to restore the mural in early 2017. This process follows many months of fundraising by the mural committee and a search to find a muralist to complete the work because the original artist is unavailable. In the meantime, the Autry and the City are working closely to monitor, clean, and paint over graffiti as it occurs on the Marmion Way wall. 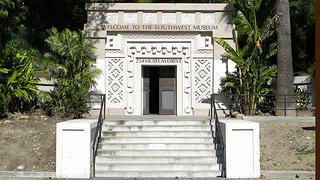 Q: We’ve talked about the historic Southwest Museum, but what about the Casa de Adobe? Are there any plans for it? Because the SWM site is much larger, and much more complicated and costly in terms of a viable reuse, the bulk of the Steering Committee’s efforts naturally have been focused on that portion of the site. But we definitely consider the Casa to be an important historic structure and a critical part of our work. Recently a local non-profit organization has expressed interest in the site as a possible partner and user. We are currently working with this group and their board to get a better sense of their concept, assess its feasibility, and develop some preliminary space plans and cost estimates over the next few months. The Executive Committee will meet with this group to consider the concept and provide advice and feedback. We hope to have the group come before the full Steering Committee for a discussion early in the new year. On October 10th, the Highland Park Heritage Trust hosted a special meeting with their members and the Southwest Museum Site Steering Committee to ask questions and discuss the status of the effort to re-imagine the historic Southwest Museum Site. The 90-minute conversation between Steering Committee members and the public was moderated by HPHT President Antonio Castillo, and it was an informative and very constructive conversation. A special thank-you to the Highland Park Heritage Trust board, Tony Castillo, all of the community members who attended, and Steering Committee members Frank Parrello, Gideon Kracov, and Prof. Jem Axelrod for taking the time to participate in this important discussion and update. We will take the questions and comments from this event back to the Steering Committee for their October meeting, and we look forward to working with HPHT as a partner to keep the community informed and engaged as we complete the market study and reuse analysis in the coming months. The Steering Committee will be very busy with several upcoming meetings in October, including meetings with potential partners. A full Steering Committee meeting is scheduled for the end of the month, where they will evaluate the partner meetings and their programmatic and philanthropic potential; discuss the recent conversation and meeting hosted by HPHT; and lay out next steps for David Bergman’s scenario planning and reuse analysis. In case you missed it, LA Magazine did a great story at the end of the summer on the Southwest Museum Site! It was a fairly detailed and nuanced piece that covered its history, the status of the collection and the new Resource Center, and the current efforts to reactive the SWM site. We were so pleased to find out that LA Magazine was interested in the SWM and were thrilled to have such a big, new audience learn about this special place! Read the full story on the LA Magazine website here. One of the featured events of Lummis Day in June was a unique, site-specific dance performance at the SWM site by the world-renowned Heidi Duckler Dance Theater. Called “143 Days”, the performance was inspired by Charles Lummis’ epic journey from Cincinnati to Los Angeles on foot. 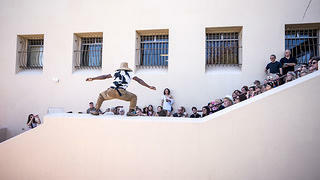 The dancers and musicians moved through and around the historic SWM building, showcasing many of its unique spaces including the main staircase, the terrace, and the tunnel. For those of you who weren’t fortunate enough to get tickets to “143 Days,” Heidi Duckler Dance Theater shared a video of their performance in the Tunnel. Watch and enjoy! Many thanks to everyone who came out to the exhibit, poetry readings, and events during Lummis Day! And a special thanks to all of you who bought tickets to see the very special performance of “143 Days” by the phenomenally talented Heidi Duckler Dance Theater! Tickets for the dance performance were a hot item and sold out well in advance of the show. The building was packed with visitors from across Los Angeles who moved through the building, outside onto the terrace, and into the tunnel as 6 dancers and 2 musicians performed a beautiful series of dances inspired by Charles Lummis and his walk across the country to LA. If you weren’t lucky enough to catch the show, HDDT will be posting photos and video of it in the near future. So check back here for more details. The Steering Committee and Executive Committee have been meeting regularly in 2016, reviewing and analyzing the stakeholder interview report, online survey results, and lessons learned from the event series, and selecting a consultant for our market research and economic analysis. Minutes from the latest Steering Committee meetings are posted at the bottom Steering Committee page when the final versions are approved by the Steering Committee. You can find the minutes from the February 2 and May 6 meetings there now. The June 7 minutes will be posted after they are approved at the next meeting. The recent work of the Steering Committee has been and continues to be focused on the market research and economic analysis prepared by our very experienced consultant, David Bergman of Metropolitan Research + Economics (M+RE). Several Steering Committee members were involved in the evaluation and selection process for this consultant, who is conducting market research and analysis for the National Trust. The Audubon Center in Deb Park is partnering with us on this research project because they also are deeply interested in understanding of local and regional markets and demographics to help determine the best options for programming, events, and revenue-generating activities in Deb Park. -At the completion of the project we plan to share the market research data with any local organizations or institutions who would find them useful. David Bergman already has completed his initial market research and a small number of stakeholder interviews, the fascinating results of which were presented to the Steering Committee at their May meeting. (For instance…Did you know 777,000 people live within a 15-minute drive of the Southwest Museum Site? Or that 40% of the residents in any LA neighborhood moved in during the last 10 years?) You can read a summary of his market research presentation and key finding in the May meeting minutes. The second phase of David’s work consists of evaluating “comparable” projects in the LA metro area and analyzing their annual budgets and operating structures. This will give us and the Steering Committee a much clearer understanding of how these places function and sustain themselves on a regular basis, and the range and type of funding sources they rely upon. The preliminary results of that detailed research were presented at the June meeting, but it was an enormous amount of information to absorb. The Committee will have a special meeting in July to continue their analysis and discussion of that research so they can begin the challenging work of assessing the options that are the most desirable, needed, and appropriate, and that also have the best potential for long-term sustainability.